The microscope-in-a-needle probes use a technology called optical coherence tomography (OCT). This is similar to ultrasound, but uses reflections of near infrared light instead of sound waves. Different tissues types have different light scattering properties, enabling OCT to acquire high-resolution images of structures inside the body. The resolution of such images is typically 5 – 20 μm. The probe contains highly miniaturized optics, which focus the light to acquire an image. The optics are manufactured by fusing together different types of optical fiber. 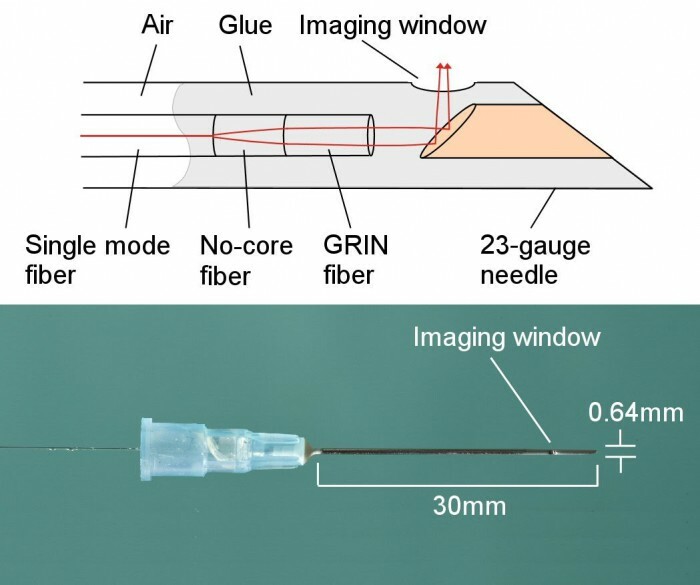 By combining exact lengths of no-core fiber and graded-index (GRIN) fiber, we can control how tightly the light is focused and the depth of field of the probe. A typical probe design is shown in the image below, along with a photo of a completed needle probe in a 23-gauge needle (outer diameter 640 μm) . A small imaging window has been etched into the side of the needle, through which the light is emitted and reflected light is collected. At the tip of a needle is a small copper mirror, which redirects the light through the imaging window. Fig. 1. Schematic of a needle probe. (bottom) Photo of a completed needle probe. The outer diameter of the needle is 640 micrometers. We use a range of different needle probes for different applications. Our smallest needle probe is encased within a 30-gauge needle, with an outer diameter of 310 μm . This probe is too small to fit a mirror. Instead, we grind the optical fiber at a 45 degree angle, and then coat it with chrome and gold to redirect the light. 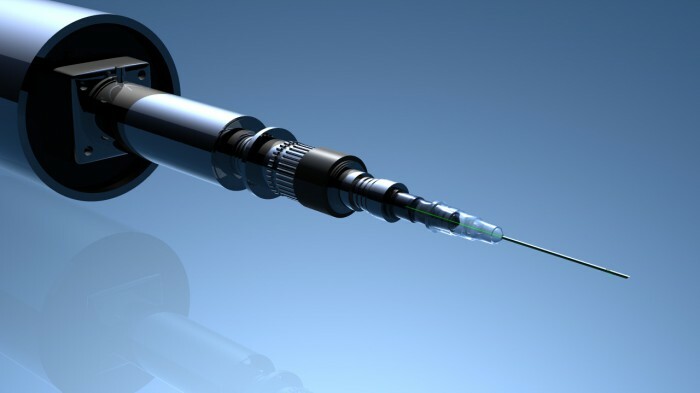 An image of a 30-gauge needle probe is shown below. Fig. 2. (left) 30-gauge needle probe. The outer diameter of the needle probe is 310 micrometers. (right) Schematic of the needle probe with reflective gold coating. A. McLaughlin, B.C. Quirk, A. Curatolo, R.W. Kirk, L. Scolaro, D. Lorenser, P.D. Robbins, B.A. Wood, C.M. Saunders, D.D. Sampson, Imaging of Breast Cancer with Optical Coherence Tomography Needle Probes: Feasibility and Initial Results, IEEE Journal of Selected Topics in Quantum Electronics, 18(3):1184-1191, 2012. Lorenser, X. Yang, R.W. Kirk, B.C. Quirk, R.A. McLaughlin, D.D. Sampson, Ultrathin side-viewing needle probe for optical coherence tomography, Optics Letters, 36(19):3894-3896, 2011. A. McLaughlin, X. Yang, B.C. Quirk, D. Lorenser, R.W. Kirk, P.B. Noble, D.D. Sampson, Static and dynamic imaging of alveoli using optical coherence tomography needle probes, Journal of Applied Physiology, 113, 2012.